Last month I volunteered to make the montly sketch for The ScrapRoom. I am always nervous that my work might dissappoint so I created three sketches just in case! Here's the two that didn't "make the cut"- lol! I hope they inspire you in some way! Please be sure to share them too! Hi there! Today on the Bo Bunny blog they are focusing on chipboard stickers. 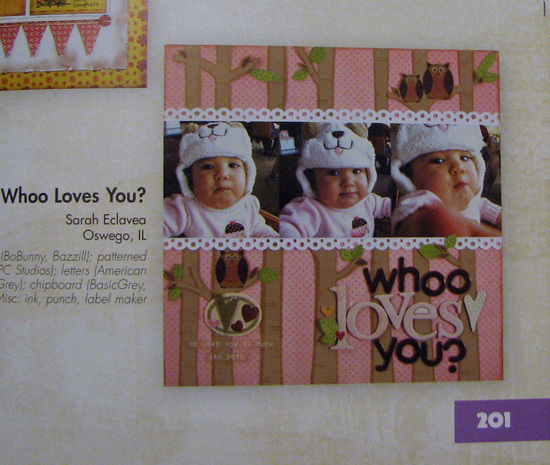 I was so happy to get this assignment because I LOVE me some chipboard stickers! They are easy to use (just peel and stick) and so super cute what's not to love, right? 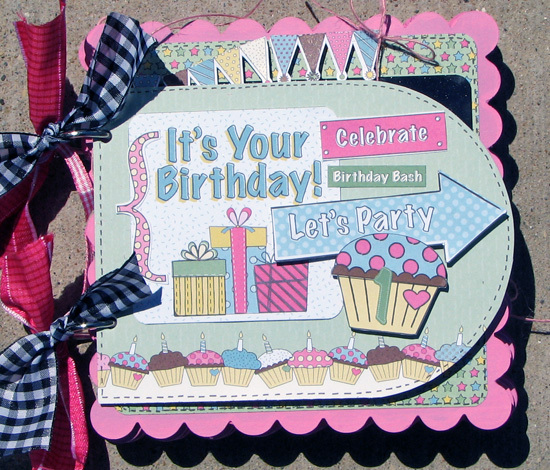 On my layout I used Barefoot and Bliss papers and embellishments and mixed up some of the 12 x 12 chipboard and Icandy chipboard. The chipboard waves were actually one big sticker, but I cut it into three pieces to better frame my layout. I also layered the chipboard (the flower on the pail) and used foam tape on my turtle chipboard piece to pop him up a bit. It looks like he's swimming in the waves! How cute is that? Thanks for visiting me today and I hope everyone is having as good a summer as that little girl in the photo! Hi everyone! 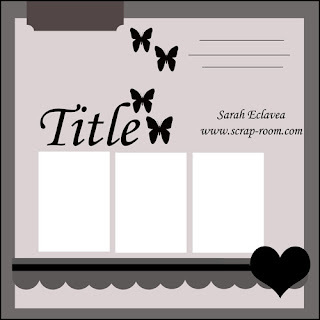 I am featured on the Nikki Sivils blog today! I have two fun projects to share that I absolutely loved making! 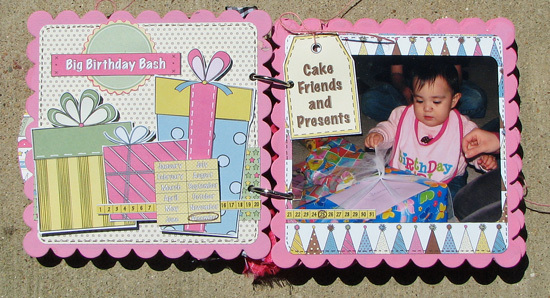 First up is this little mini album I made of my little girl's first b-day party using Nikki's "It's Your Day" papers and embellishments. 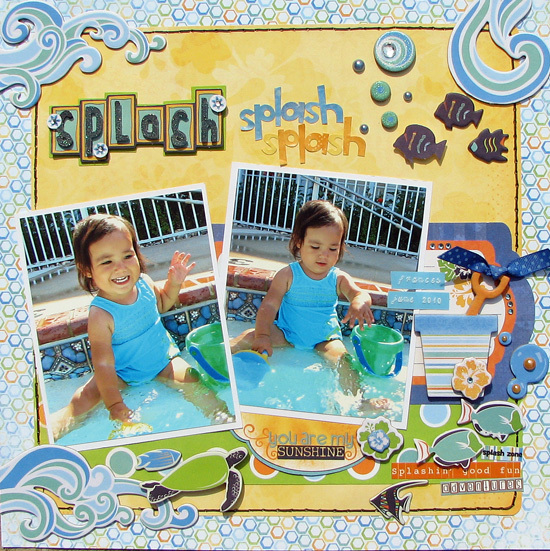 To create the album I used the Nikki Sivils scalloped chipboard album for the pages and one page from the North Pole lights chipboard album for the cover. I painted the edges of all my pages a fun bright pink to coordinate with the papers. 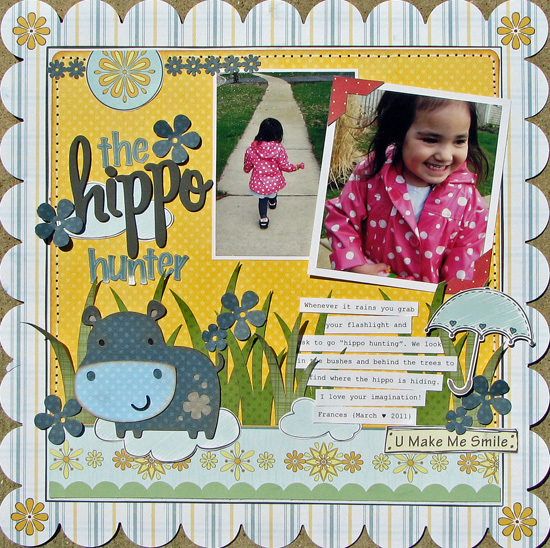 Next up I have a layout of my sweet Frances doing something she loves to do when it rains- Hippo Hunting! Not sure where she got this from, but whenever it rains she says we need to go hippo hunting. She grabs her flashlight and I put on her rain coat and we go walking around the neighborhood looking for hippos. She even says "there's one mommy" and points them all out to me! This girl has some imagination! 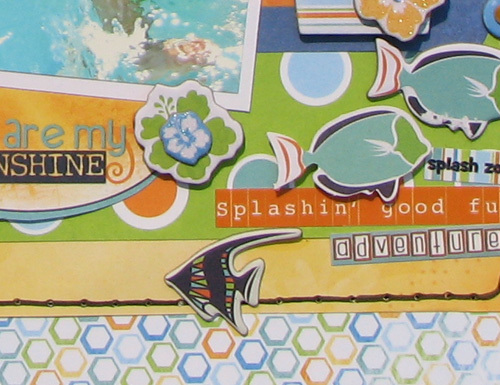 On this layout I used Nikki Sivils "It's Raining, It's Pouring" paper and embellishments and my cricut Create a Critter cartridge to cut the little Hippo. 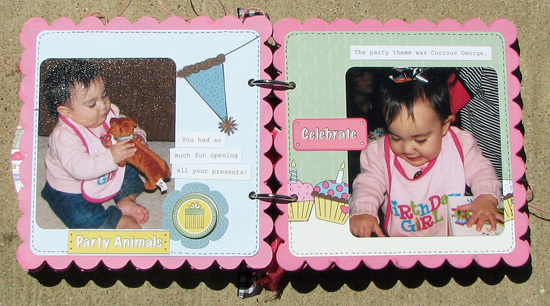 I can't believe how much older my little girl looks in these pictures compared to her birthday album! They grow so, so fast! Yay!! I finally received my copy of this book! And it is a big book indeed. Lots and lots of amazing layotus to look at! It's been so long I almost forgot about this layout! Especially since they have had it all this time too. If you want a copy you can order it from Amazon.com and I have heard Hobby Lobby is selling it too! Thanks for coming by. Tomorrow I will have two new Nikki Sivils projects up so please come on back. Good night! Good morning all! 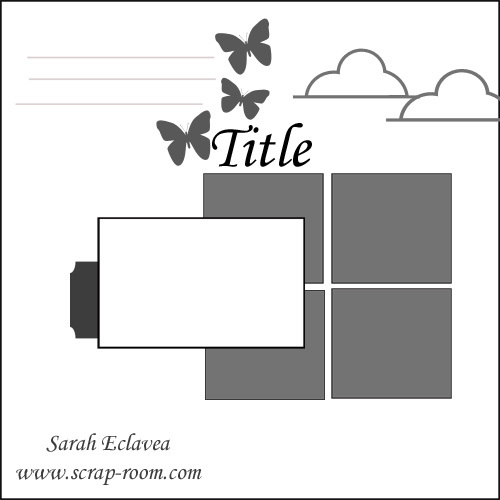 I have to say that I have now created a total of three mini-albums. At first I hated them and alwas gave up before I finished. 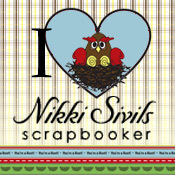 But I guess I was just using the wrong papers because when I use the Nikki Sivils papers I LOVE them! 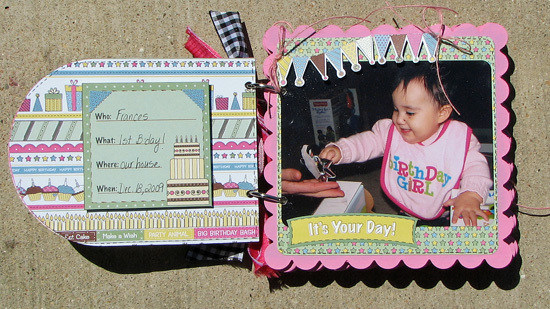 I can only show you a peak of this mini I created of my Frances's first b-day using "It's Your Day". The whole project will be posted next week. I do hope you will come back to see the rest of it! Nikki is busy working her magic for CHA summer! I for one cannot wait to use some of those goodies! I guess just need some patience! I feel like my 2 year old waiting though! I am loving all the new additions to Nikki's lines! 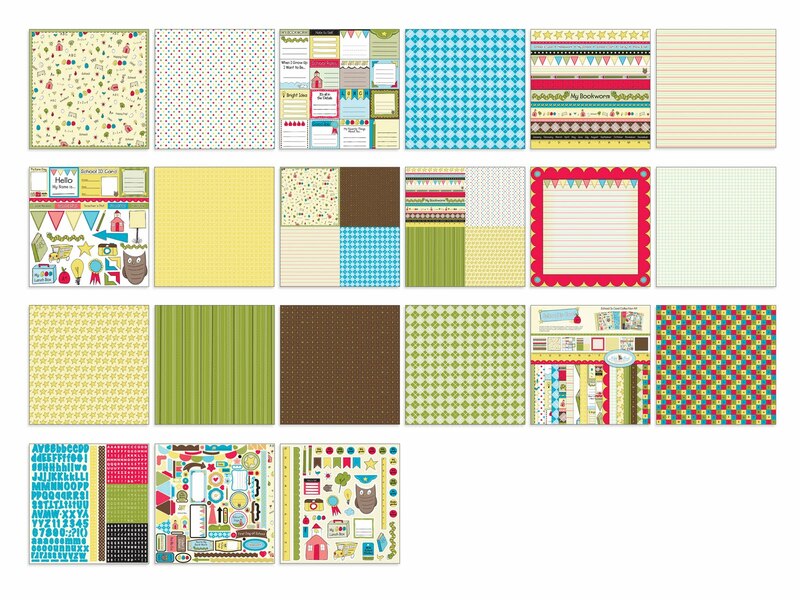 There are more patterned papers, a 12x12 stickers sheet, a die cut sheet and a 12x12 sticker sheet that is just all images! How fun is that???? And she is also going to be coming out collection packs too. Thanks for coming by and checking out one of Nikki's new lines! Hello! I hope everyone is having a great day! First I would love to share these pictures of my sweet little Isabel with you! She turned 7 months old yesterday and she is just the cutest little thing. I can't believe this little princess is already 7 months old! It seems like just yesterday I couldn't wait to meet her. And now for the wedding! 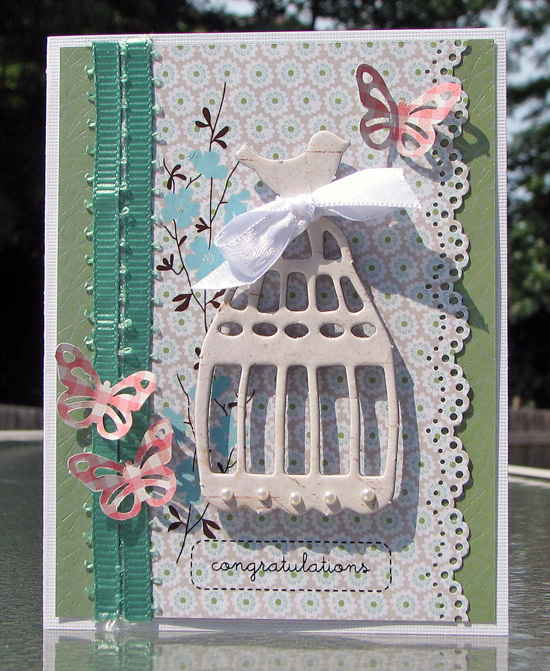 My friend is getting married so I made her this card for her wedding shower. I used all my "extras" on it and I am really happy about how it turned out. Almost too happy to give it to her! Just kidding! Hehe! 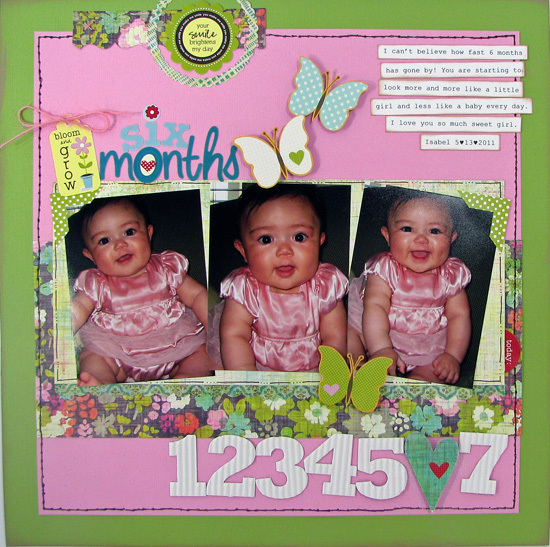 The background papers are SEI Corrine from The ScrapRoom June Kit, the chipboard is Crate Paper Portrait from The ScrapRoom May Kit, the ribbon and rubons are American Crafts and the pink paper the butterflies are punched from is Pink Paislee. That Pink Paislee paper is my favorite from the Valentine's line two years ago. 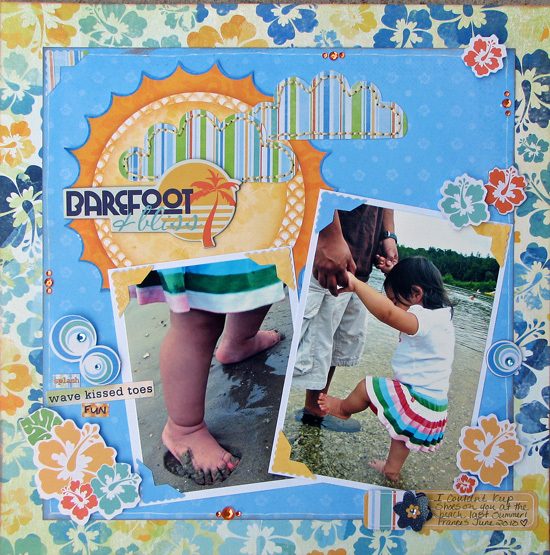 I am down to just a a quarter of a 12x12 sheet, but I won't throw it away! Thanks for coming by today! I have lots of projects just waiting to be posted so I would love it if you would come back soon! Hi all! 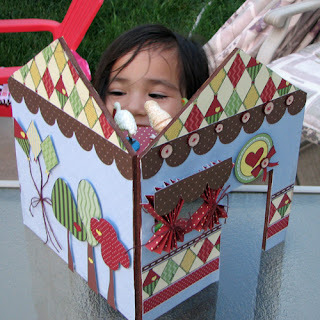 A few weeks ago I was asked to participate in this year's Elmer's Craft and Tell and now I can show you my project made with Elmer's and Nikki Sivils, Scrapbooker products. Now I can show all of you my project. So I am "crafting" and "telling" so to speak! 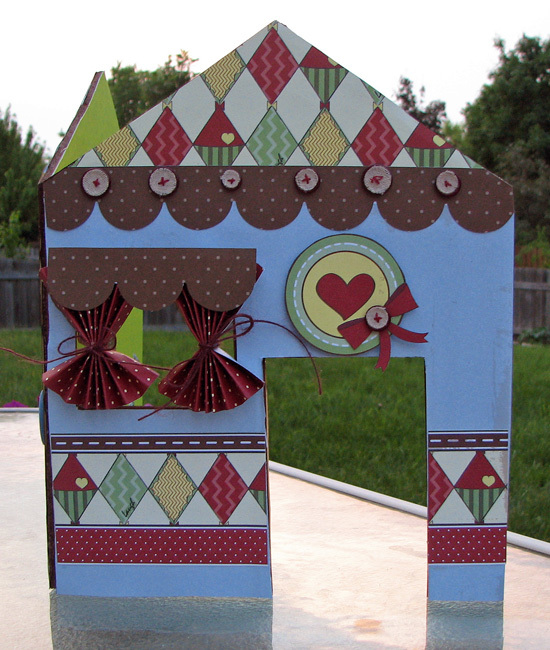 There will be two teams of Nikki's girls "crafting and telling" this weekend. One team on Friday and one team on Saturday. Now for my project! As soon as I saw the foam board I had this idea to make my daughter a little house for her toy animals. And the Nikki Sivils "We are Family" collection was perfect to decorate my house. I used the craft knife and mat to cut the shape of my house (I just did it free hand by first sketching on the foam board in pencil, cutting and erasing my pencil marks). 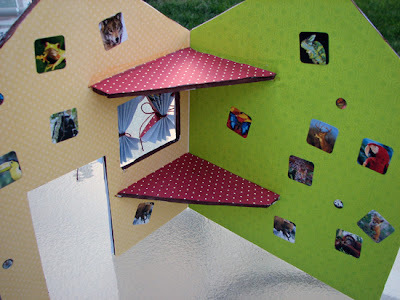 Then I used the scissors to cut out my paper to match and the craft bond glue (which is AWESOME) to adhere everything. There were also some paint markers included that I forgot to add to the photo above. I used the brown one to color the white edges of the foam board. Those are markers are great! The are just like acrylic paint, but soooooo much easier and less messy! My daughter loves the tv shows Dora the Explorer and Go Diego Go. 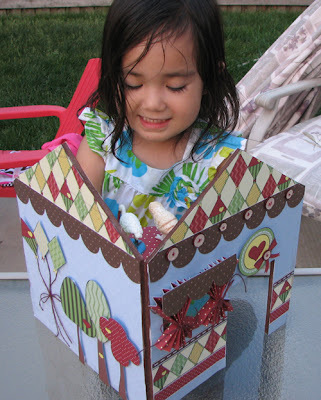 She wanted to make this a house for Dora and Diego and the animals they rescue. That's why there's animal stickers inside. We call it the rescue center. She puts her little Dora figure in the winder to look out. It is sooo cute! And her playing with it! 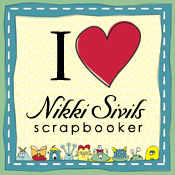 After visiting all the blogs go to the Nikki Sivils blog and leave a comment for a chance to win a prize. You will have until June 12th at midnight CST to leave comments. There will be a prize given both Friday and Saturday so check Nikki's blog on Saturday to find out who is on the team for that day. The winners will be announced on the evening of June 13th. 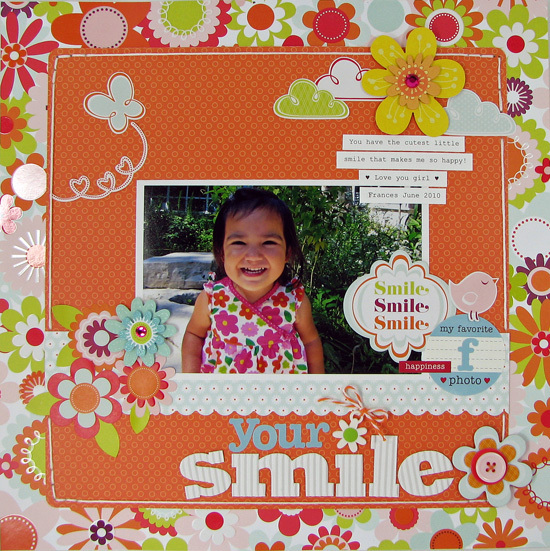 that the Divas from Nikki Sivils, Scrapbooker sent you over!!!! 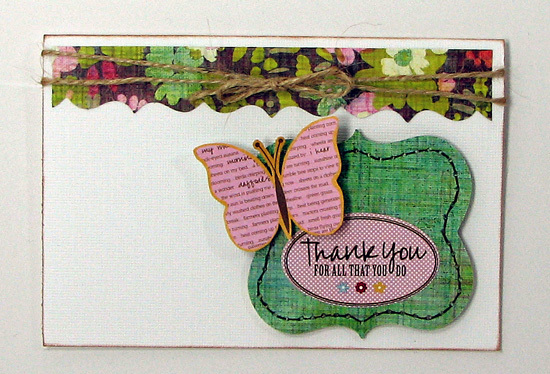 Thanks for coming by and enjoy the projects! 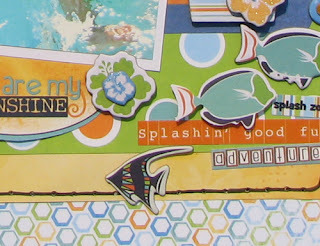 I am just loving the June Kit from The ScrapRoom! I used up every last piece of paper from my Double Shot kit and now I am moving on to my Flavors of the Month kit! If you aren't familiar with the ScrapRoom kits let me tell you a little about them. There are two choices of kits the Double Shot Kit and The Flavors of the Month kit. 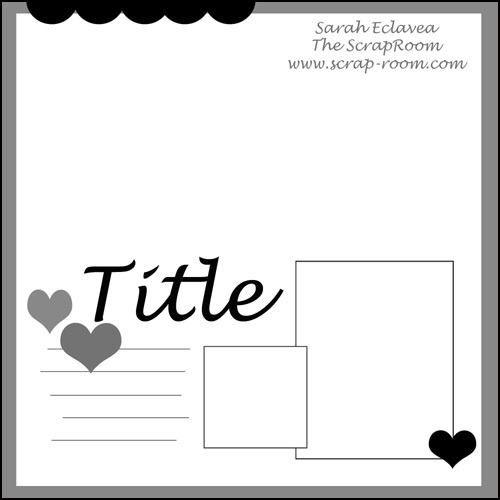 The Double Shot kit (which I mainly design with) consists of two paper collections that you can use to make several pages. The Flavors of the Month consists of four paper collections that are different than the ones in the Double Shot kit. So you can order one kit or both and you will gets lots of goodies from different manufacturers. I love that each kit is really a combination of smaller kits! That way I have lots of variety. With most kits I usually have lots left over because there is so much of each collection. This is my little girlie last summer. This is her "say cheese" smile! It is soooo cute! I also created this sketch to go with my layout to give you all some inspiration too. Enjoy! It's time for the monthly ScrapRoom sketch challenge and this month's sketch was provided by me! And here is my layout based on the sketch. I mixed up the two lines in this month's Double Shot kit- Basic Grey Sweet Threads and Jillibean Soup Blossom Soup. 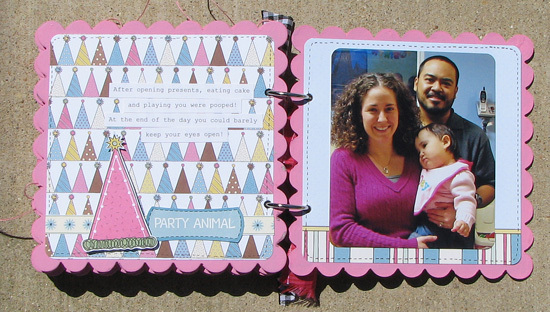 Tammy did such a great job putting this kit together. The two lines just look like they go together. And sorry for the glare! I was having photography troubles that day! Thanks for coming by and please hop on over to the ScrapRoom blog where the rest of the DT has a take on the sketch. We would also love to see your layouts too. 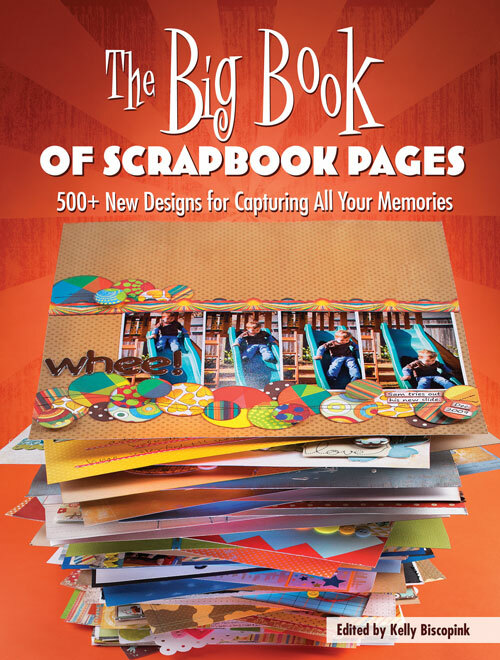 There is a prize up for grabs from the ScrapRoom store. Have you seen Bo Bunny's new release "Barefoot and Bliss"? I have been very patiently waiting for summer so looking at this paper makes me HAPPY! I have to admit that the girls have lots of summer outfits with these prints and colors and it matches the swimsuits they got in their Easter baskets too. So I will be using a lot of this collection! There are lots of other great projects on the Bo Bunny blog today for 'Free for All Friday' so please stop by there if you get a chance! Hi there, I have a few things for you today! 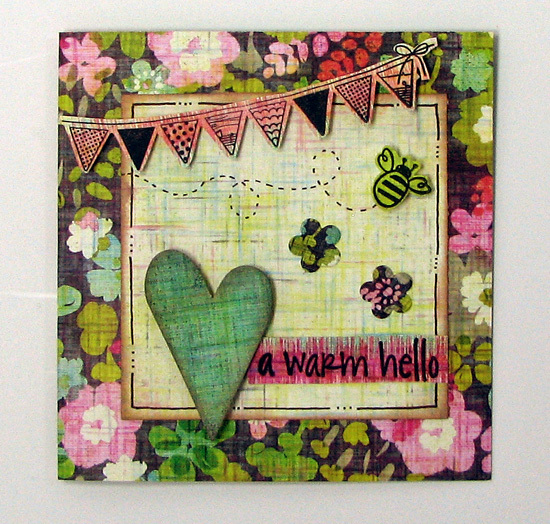 First up- a few cards I created with the ScrapRoom's June Double Shot Kit. And second- if you haven't already heard the always so sweet Nikki Sivils is coordinating a scrapbooking drive to benefit victims of the Joplin Missouri tornado. She is just the sweetest and I feel lucky to work for such an amazingly kind and generous woman. I already have a big box of supplies to ship of to here! 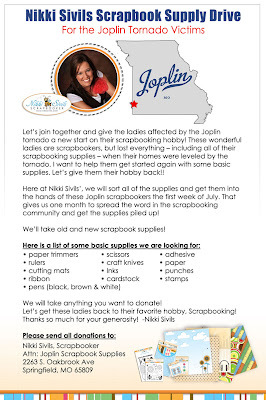 All the details can be found on Nikki's BLOG and on the flier below (click for a larger image). Hello everyone!! It is June 1st, and you know what that means...KIT REVEAL!! And it is a good one! The hop begins at Lan's blog, but all of the blogs are linked in case you get lost along the way. 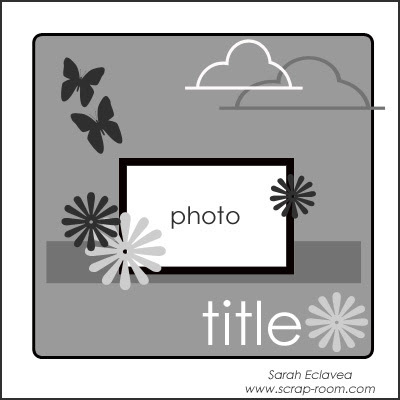 Just follow along the blog path, and keep hopping until you reach your last destination which is The ScrapRoom Blog!! Make sure you become a follower and leave a comment at each blog telling our wonderful designers what you liked about their project! When you reach The ScrapRoom Blog, leave a comment letting us know that you finished the hop. 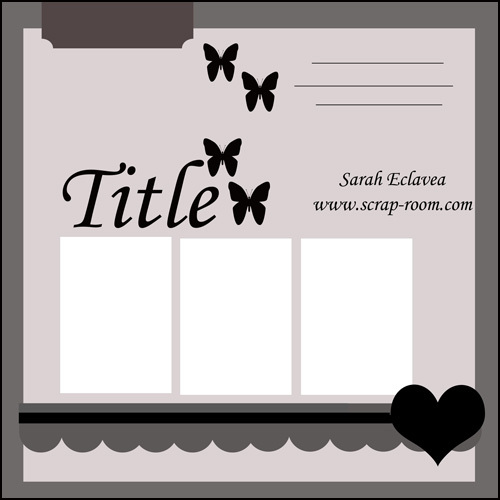 One blog hop participant who follows the rules, will be chosen at random to win a $5 gift certificate to The ScrapRoom Store! Whoot! Whoot! 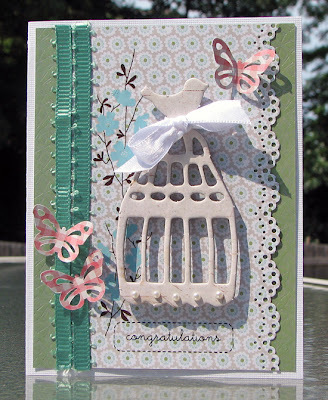 Check out the blog Tuesday, June 7th for our winner! 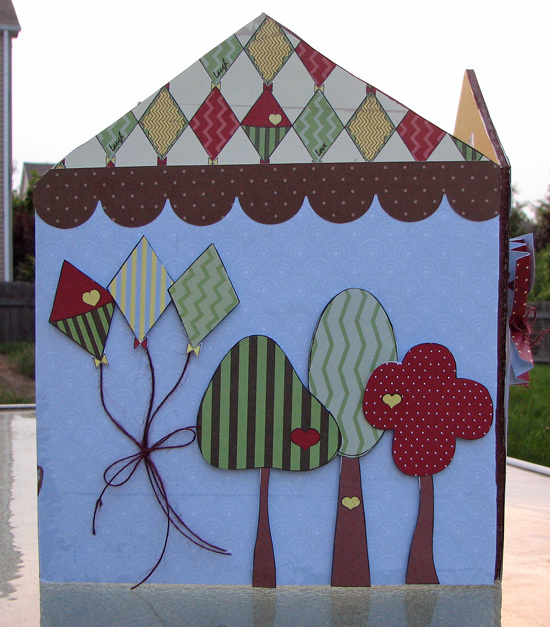 Today I have a layout to share that I created using the Basic Grey Sweet Threads in the Double Shot kit. 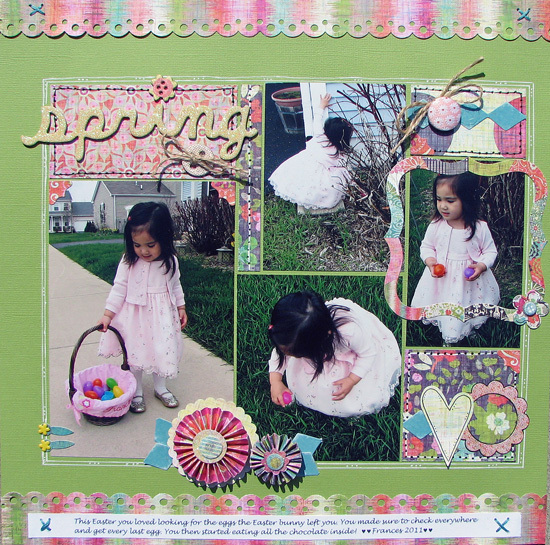 The colors reminded me of Easter so I got out my Easter photos. Sure enough the colors match her Easter Eggs perfectly! 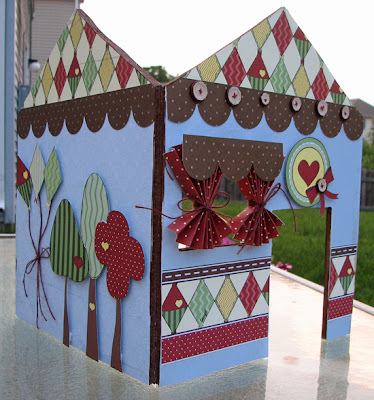 Everything on my layout is included in the kit except for the title, chipboard buttons (which are from the March Double Shot kit) and twine; and the brads and stickers are from June's embellishment kit. 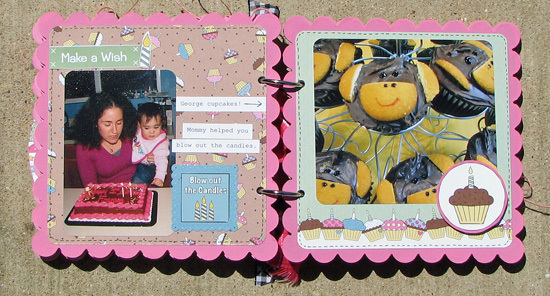 I also have another layout and two cards to share in The ScrapRoom gallery. Thanks for coming by! Next you are going to Jenny's blog!